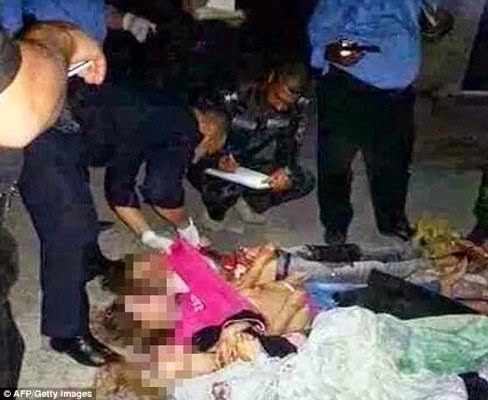 Horrific pictures have emerged showing the bodies of some of the 25 women murdered in a raid on a Baghdad brothel. Gunmen wearing camouflage and carrying weapons fitted with silencers reportedly burst into two apartments in they city's Zayouna district on Saturday evening before massacring everyone inside. Police arrived at the building to find blood streaming down the stairs. Inside they discovered the bodies of dozens of women scattered around two apartments. Most of the victims appear to have been killed by gunshost wounds to the head. In one image the bodies of five women are seen slumped together on the floor of bathroom. In another the bodies of eight women are seen lying in a pool of blood in what appears to be a living room. MailOnline has decided not to publish these images. While no group has yet claimed responsibility for the murders, locals believe the killings were carried out by Shiite militants opposed to prostitution. The attacks happened late on Saturday night at an apartment block in , a mixed Sunni and Shiite district of Baghdad. Police believe men using silenced weapons carried out the executions, before scrawling 'this is the fate of any prostitution' on one of the doors. Officers have now cordoned off the street, with residents reporting that the sole access point to the building has been blocked off.